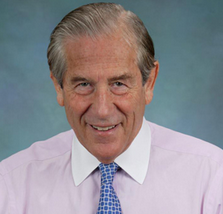 Our featured presenter, John Browne, is a distinguished former member of Britain's Parliament who served on the Treasury Select Committee, as Chairman of the Conservative Small Business Committee and as a close associate of then-Prime Minister Margaret Thatcher. Mr. Brown was a major in the Grenadiers of the Royal guard, serving as a pilot and a parachutist, and has almost 40 years experience in finance and international business. He is a frequent guest on CNBC, CNBC Asia, Fox Business News, Fox News, MSNBC and Newsmax. As Vice President of the United Kingdom Independence Party (UKIP) which triggered and won the Brexit Referendum, he will give his insider views on the why, the how and what's next for Brexit and how the Referendum vote compares to the U.S. election result. Ticket prices include a delightful dinner in the elegant surroundings of the Colony Hotel. Please join us for an evening of provocative politics!